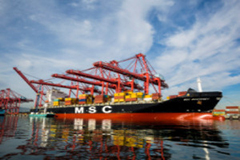 Faced with a softening global economy and declining demand for consumer goods, the ocean carrier industry is responding with the formation of new vessel-sharing alliances intent on increasing efficiency and competitive advantage. The San Pedro Bay ports and surrounding communities will benefit from a $23.6 million state grant to advance the testing of zero-emissions drayage trucks. In early May, the California Air Resources Board announced the grant to the South Coast Air Quality Management District to support the demonstration of 43 zero-emission electric battery and plug-in hybrid drayage trucks to accelerate commercialization of clean heavy-duty technology.